Pet Care cat play with toy cat's play with toy is good for cat Why Won't Cats Play With Their Own Toys? Any cat owner will know that the last thing a cat will ever use as a bed is the expensive bed you bought for the purpose and the same rule applies to toys. It doesn’t matter what extravagant creations you invest in they would much rather play with something they shouldn’t. I often wonder if this habit is due to toy manufacturers having got it all wrong or whether it is a deliberate tactic on the part of the cats to cause disruption. I suspect the latter! I have an exotic variety of feline toys which are supposed to delight and amuse my pets but which actually reside permanently in the kitchen drawer because they are never used. I may have found them interesting but my cats evidently do not. What they do find fascinating is much more problematic and has often led to disaster. Take Paolo my most mischievous pet. He just adores Christmas because he can’t resist the baubles on the tree and he has a major fetish for wrapping paper. I can’t wrap a single present because he immediately jumps on the paper and rips it and then when I escape to another room to finish the job he simply waits for the gifts to appear under the tree and then proceeds to eat them. Everyone in this house gets presents with claw holes and chewed ribbons if there is any wrapping left at all. The tree has taken a tumble on several occasions too and it is only a matter of time before something is smashed. Paolo’s other favourite game is electric cables. He stealthily makes his way behind the TV stand and starts to chew his way through the cables that are concealed behind the unit. It is one thing having your Sky service interrupted by the weather but much more awkward when your cat has eaten the cable not to mention the possibility of electrocution. Sam on the other hand has a thing for soft toys. He likes sleeping with a Teddy Bear and will play with any small toys that are left lying around. He has developed a taste for the collectable Maileg Mice much loved by a friend’s daughter and another friend’s Minion toy has mysteriously disappeared. This has no doubt been secreted somewhere by my darling feline friend who has no interest in Despicable Me but clearly has a taste for the merchandise. Nothing is safe in my house or indeed the garden. Caspar has a strange hobby which basically involves biting the heads off flowers and spitting them out. I have stopped planting pots and baskets with bedding plants because within days they are all headless and I have a sorry display of stalks. He especially likes verbenas for some reason and even tries to tackle the roses despite the thorns. He obviously doesn’t like the taste of these things and so I have to wonder why he does this. Perhaps he feels that flowers are a wanton expenditure as the money could be spent on cat treats instead! 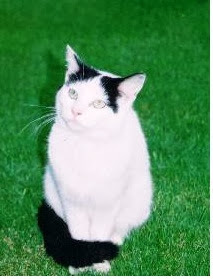 Sally Stacey is a keen writer and animal lover whose work is constantly interupted by her cats.